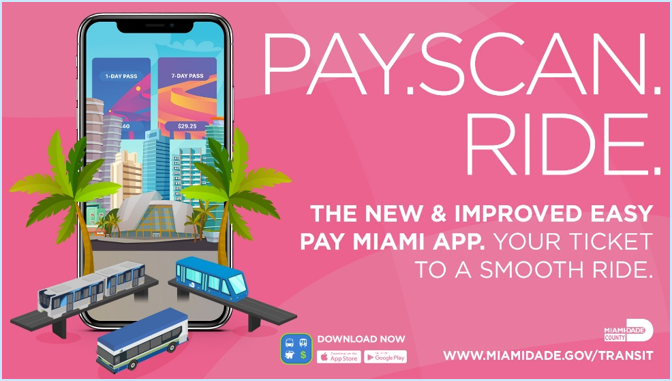 The new EASY Pay Miami app version includes several new features that make it easier for riders to PAY.SCAN.RIDE. The primary goal is to increase digital fare purchases. To accomplish this, a comprehensive marketing campaign was implemented with digital ads, billboards and social media, which generated 15,600 downloads on its first six weeks. Cash and magnetic passes were the norm to pay for bus rides in Polk County for decades. 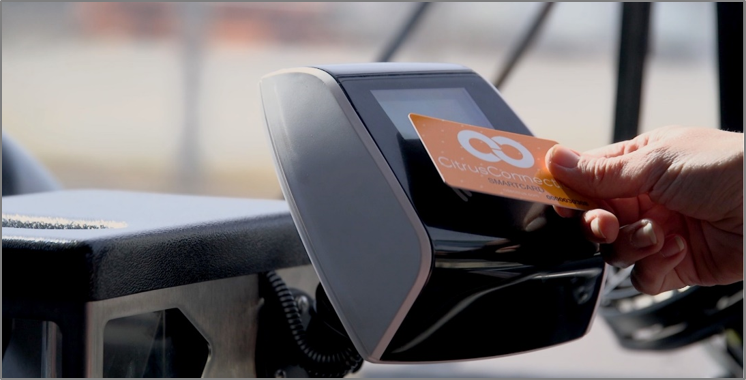 Citrus Connection's plan to change its fare box media to a SMARTCARD system required a massive campaign to smoothly transition riders away from the only way they know how to pay. Mission Accomplished. * Best of the Best * The EASY Perks Program was created to incentivize transit ridership. Business participants offer a discount to customers who are EASY Card or EASY Ticket holders. 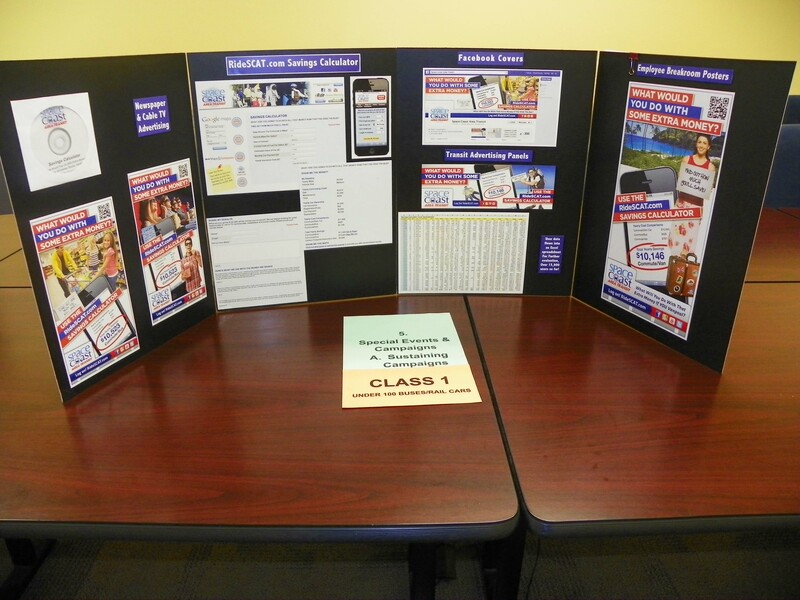 In return, the Department promotes their business through various marketing tools. The program started in January 2017 and now boasts 52 participating businesses. Citrus Connection relaunched the COLTS program providing nearly 30,000 trips for Polk County high school students. Coupled with the Summer of Safety program to cover student trips during the summer, they proudly provided nearly 38,000 trips to get to after school activities including tutoring, athletics, clubs and other extra-curricular activities. 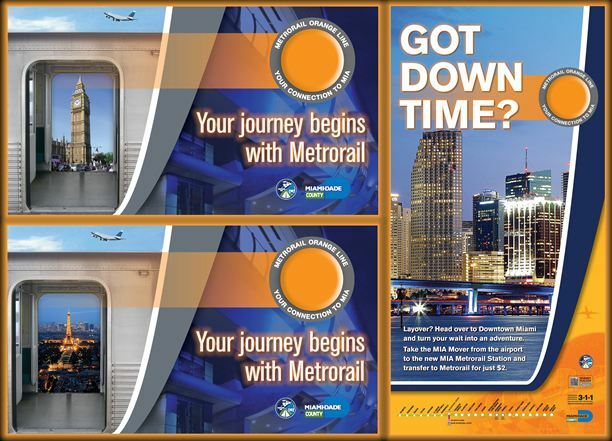 *Judge's Favorite* This multi-platform campaign promoted Tri-Rail as a smart way to get to and from the region’s three major airports. 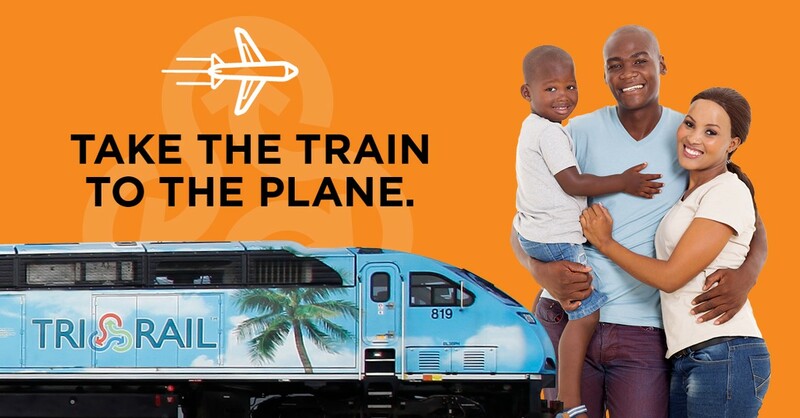 With the incentive of a $500 American Airlines gift card, consumers were directed to Tri-Rail’s website and South Florida residents and visitors learned more about taking the train to the plane. 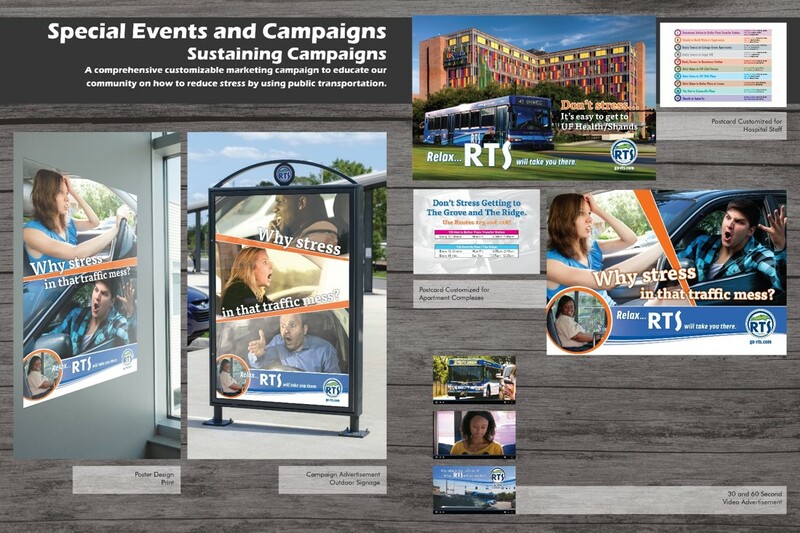 The RTS “Don’t Stress…In that Traffic Mess” campaign incorporated customizable post cards, posters and a video to target choice riders. 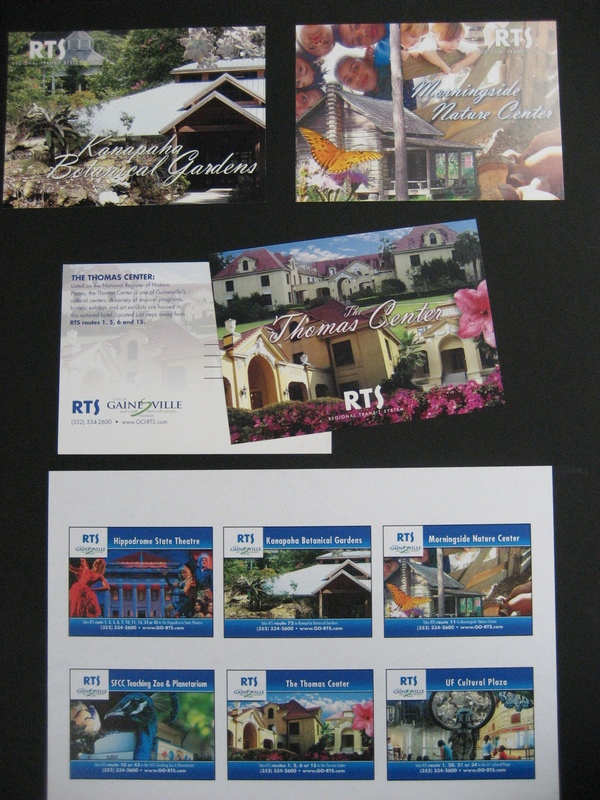 Post Cards were customized to target specific apartment complexes, the University of Florida and UF Shands Hospital. The video was posted to local cable, YouTube (750 views) and Facebook (400 views). RTS ridership on post card routes increased by about 13 percent after the campaign launch. Streetcar Live is A monthly concert series featuring local and regional acts on board The TECO Line Streetcar System in Tampa, Florida. 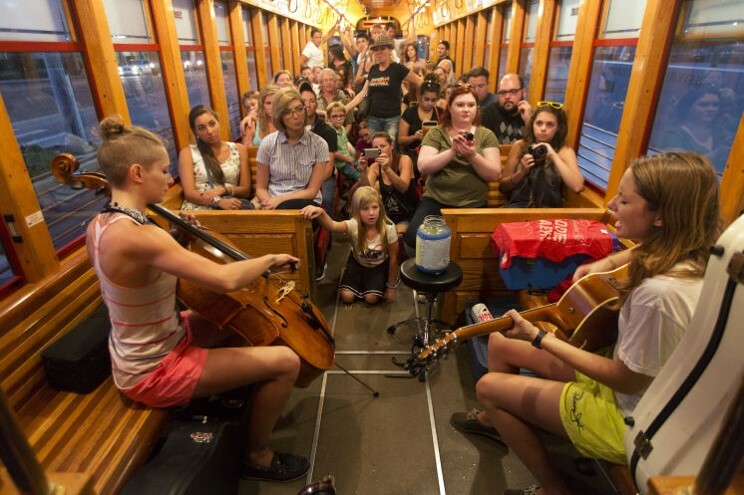 The concert is included with streetcar fare. Escambia County Area Transit wanted to improve the perception of public transportation in the area. The system launched their year-long ECAT Harmony campaign with the goal of leading people to fall in love with ECAT’s many services. Using integrated marketing techniques, the campaign was able to garner over 2.5 million positive media impressions. 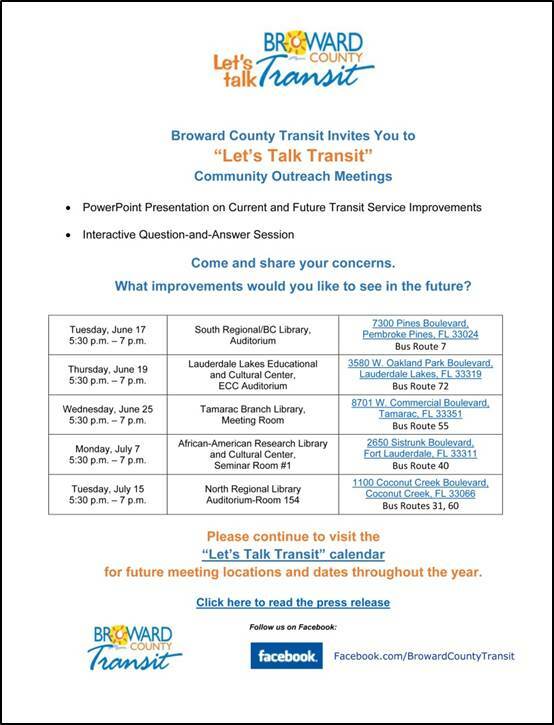 “Let’s Talk Transit” was developed to enhance public awareness of service improvements needed in the future. The campaign was effective. It sparked new interest from current passengers and non-transit riders throughout the community, generating 733 website visits in the first two months of the campaign and 1.6 percent ridership. When StarMetro partnered with Second Harvest of the Big Bend for a food drive, they decided to go all in. The goal was to fill an entire StarMetro bus with non-perishable foods. Using e-blast, social media and media outreach, they were able to “Stuff the Bus,” collecting 2 TONS of food. 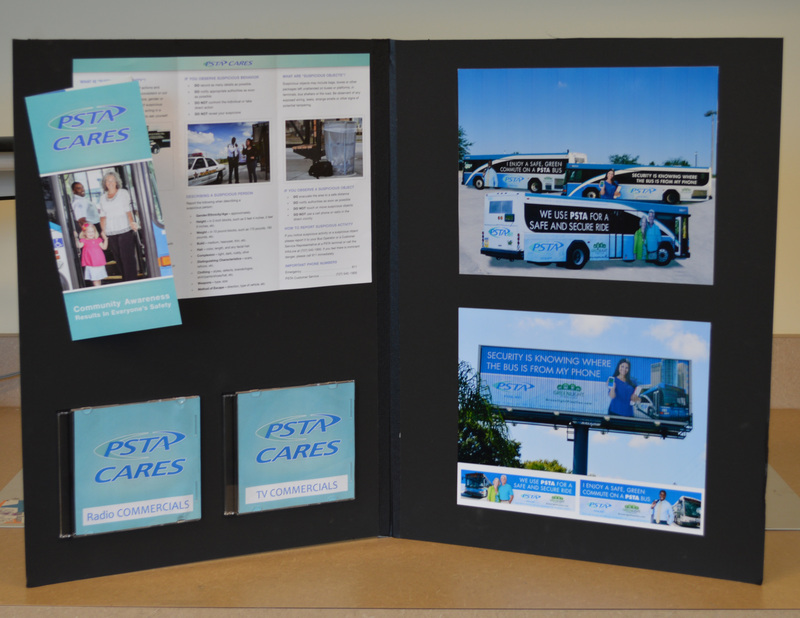 PSTA developed the CARES program – Community Awareness Results in Everyone’s Safety – which was funded by a grant from the Department of Homeland Security. This campaign included a series of three television and radio commercials with coordinating billboards and bus exteriors that shows every day people who use the bus to go to work, school, and entertainment. The Savings Calculator Campaign features a mobile and desktop website calculator that details how much money can be saved by riding the bus or van-pooling instead of driving or owning a car. The messaging directly asks the consumer, “What would YOU do with some extra money?” followed by some motivating ideas. Target Audience: Miami-Dade County residents and visitors Project Cost: $124,914 Description: The July 2012 launching of the Metrorail Orange Line to the new Miami International Airport Station was the most significant local transit expansion in decades. A broad marketing effort was set in motion in May, targeting both local residents and out-of-town visitors who stood to save money on taxis, rental cars and parking to get to the airport. The elements of the campaign – outdoor and indoor posters, web banners, and newspaper ads – were deployed incrementally before and after the launch. The web ads have generated over 98,000 visits and the new station has averaged nearly 2,000 daily boardings. Target Audience: Santa Rosa community and residents Project Cost: $19,500 (production/materials – $5,000, design – $7,500, publicity – $7,000) Description: To save the recently launched public transportation pilot program from elimination, Santa Rosa Transit launched a campaign that would attempt to boost ridership by 25 percent before the elected officials meet in December 2011. 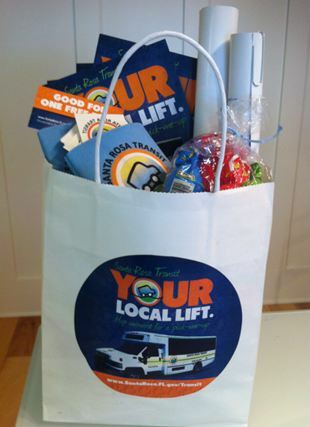 The name of the campaign was “Santa Rosa Transit: Your Local Lift”. 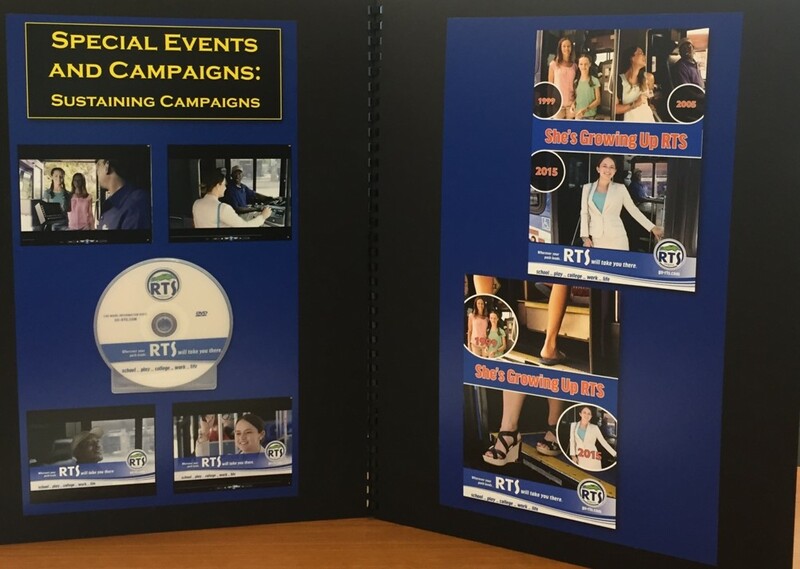 The concept communicated that SRT not only physically gives riders a “lift” to a variety of locations, but collectively gives the community a “lift” by connecting people and businesses. The tagline, “hop onboard for a pick-me-up” was used as a call to action. To increase visibility on the roads, we recommended that buses be outfitted with campaign graphics. Large exterior window clings were installed to educate potential residents on the “how to” of hopping onboard. 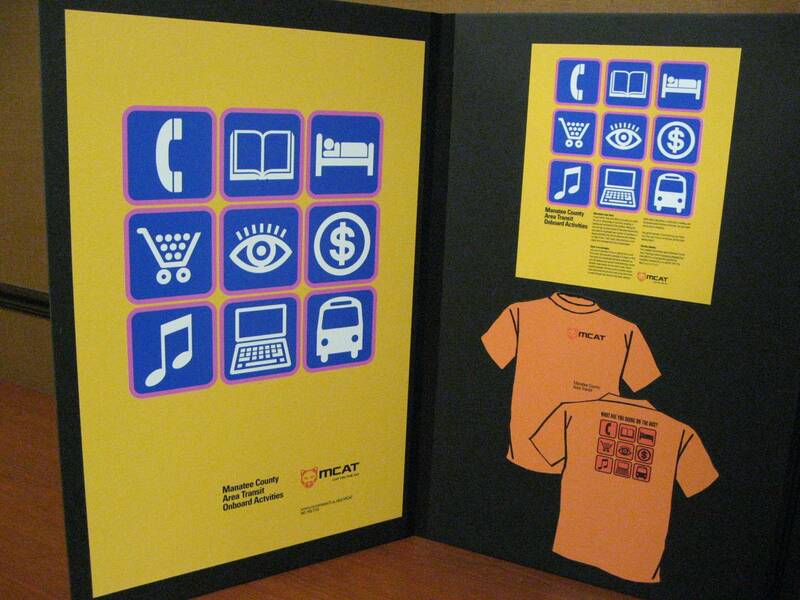 To effectively reach businesses along the route, our team developed an awareness toolkit. 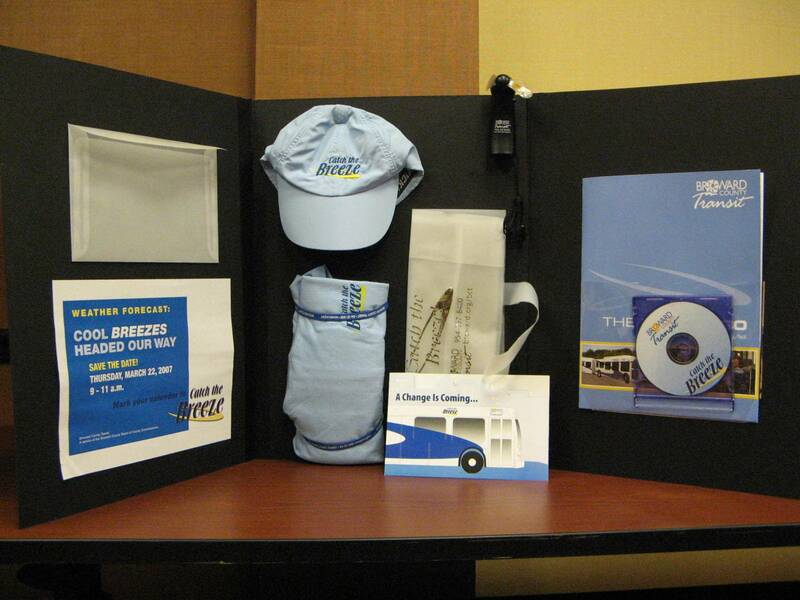 This kit contained a variety of items including 11×17 posters for display, “how to ride” flyers, complimentary free ride coupons and promotional items. We identified high-traffic target businesses along the SRT route and hand-delivered tool kits with branded bags of sweets. The response during these in-person drop-offs was extraordinary but for this to work strong public and community relations were needed. Business owners and store visitors were stunned and excited to learn about the SRT route. In conjunction with this grassroots approach, we focused on targeting potential riders along the route with a direct mail drop. 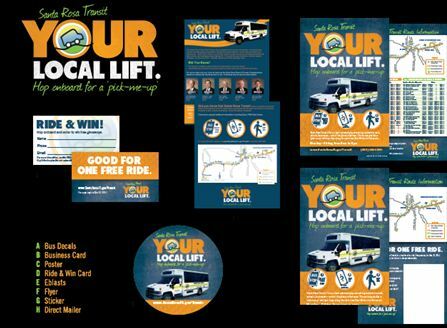 This two-sided mailer contained the route schedule and a free ride coupon. With many of these activities occurring during the busy holiday time frame, our team decided to use this possible flux of in-store foot traffic to our advantage. We coordinated community “touch point” events to interface with potential riders, and provide them with route info and giveaways. Crowded locations included such venues as a Winn Dixie Store the evening before Thanksgiving. To focus on educating non-riding residents and elected officials, our team implemented e-blast distributions, all which exceeded industry standard open and click-through rates. Throughout the campaign, we worked closely with print, TV, and radio media outlets to secure positive publicity about the growing system. In just five short months, ridership increased 36.9 percent which blew past the original goal. With a majority vote, Santa Rosa elected officials opted to keep the SRT service for another calendar year. 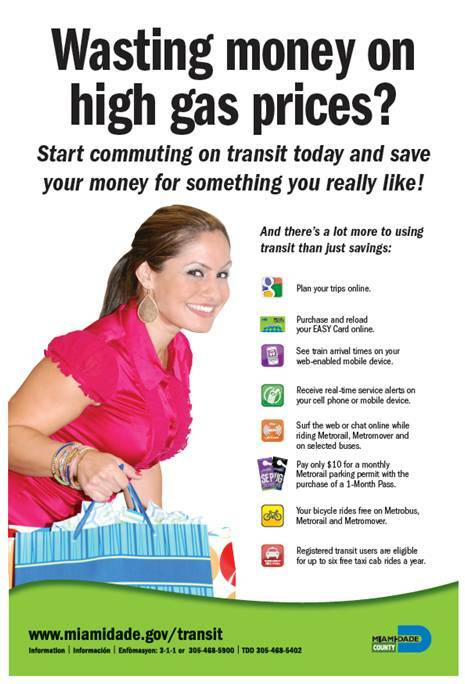 Target Audience: Miami-Dade County Residents Project Cost: $1629.50 Description: The Ridership Campaign message illustrates that transit riders save money by using MDT instead of their vehicles to take them to work, school or any of their leisure activities. The money saved can be used on items and activities they truly enjoy; i.e. shopping, family vacations, etc. Reminding commuters about other more cost-effective transportation options available to them proved to be a powerful message during these difficult economic times. The bright, attractive ads included 30 Ultra Super King bus wraps, 75 Bus Shelter ads, and 2 rail car wraps. The photography, graphics, layout, and artwork was produced in-house. The models were transit employees. Target Audience: Riders and New Riders Project Cost: $3,890 Description: Google Analytics has proven the success of the “We’ve Gone Google Campaign”. 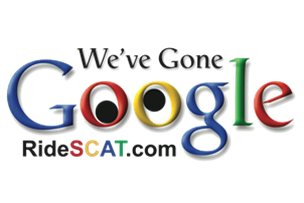 The number of visits to RideSCAT.com, including the mobile version of RideSCAT.com for android browsers, has increased by 18.4%. The Google Trip Planner is used by 48.4% of the visitors to the site. A video showing how to use the trip planner, placed on the website and on our YouTube channel (both in English and in Spanish), delivers our message electronically for free. By empowering riders to access Google Maps and use Google Transit to plan their own bus trip from start to finish, the number of questions bus drivers are asked has been substantially reduced, helping to increase on-time trips by 17.6%. Target Audience: MDT's entire riding and potential riding public Project Cost: $53,840 Description: On Oct 1, 2009, MDT replaced its 25-year old fare collection system with a new smart card system to enhance customer convenience and flexibility, reduce fare evasion, and vastly improve ridership data. 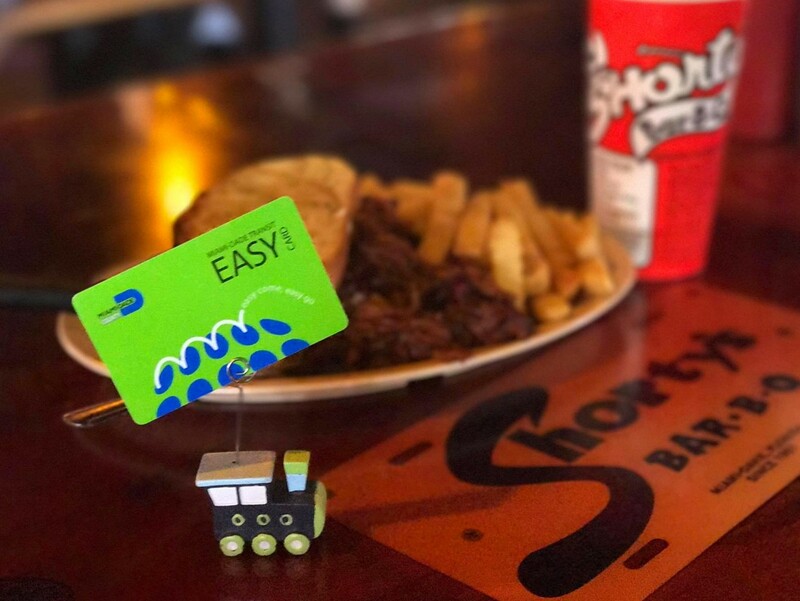 The EASY Card required a major education and outreach campaign to build awareness and acceptance of the new system and ensure that riders were prepared for the transition. 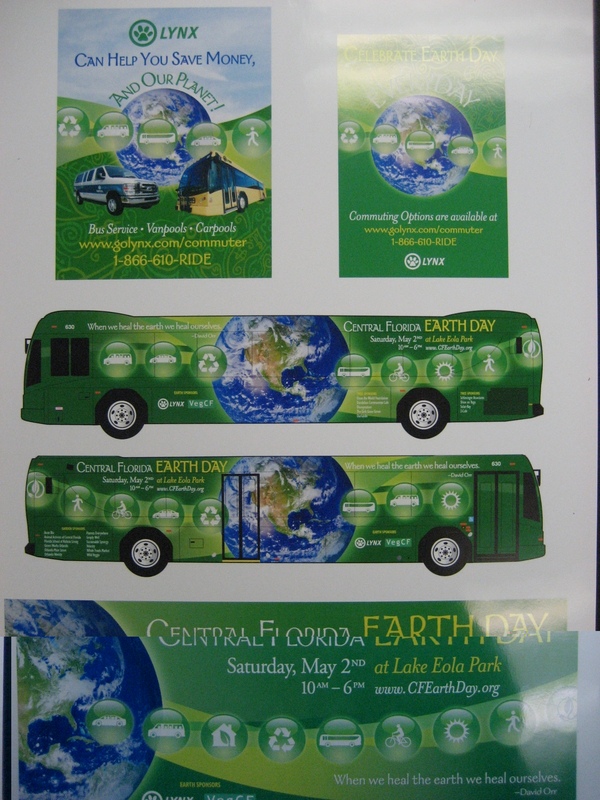 The campaign included unique branding for the EASY Card, as well as radio and TV promotions, community outreach, interior/exterior bus and rail advertising, comprehensive print media campaign in three languages and an easy-to-use EASY Card website where riders can purchase, load, and register their EASY Cards for balance protection. The riding public was made aware of all the benefits of the new system with a particular emphasis on the ease of use and flexibility of the new card. Patrons also were kept informed throughout the conversion to the new system, ensuring widespread acceptance and a smooth transition. 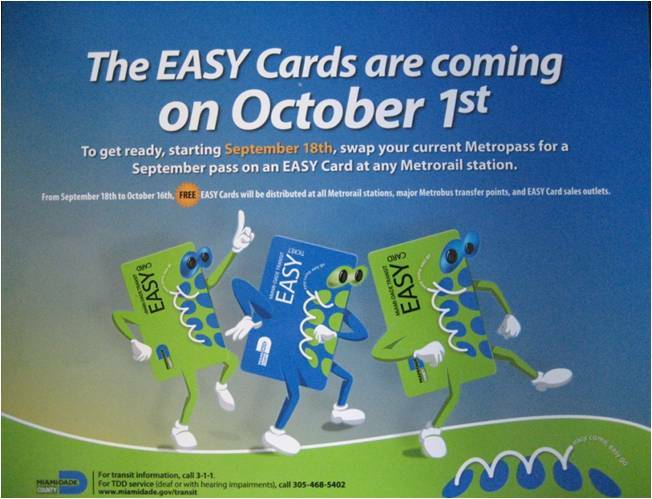 During the system's one-month soft launch phase, which ran through the end of September 2009, customers had the option of either using their EASY Card or paying cash at the faregates. Staff was stationed at each Metrorail station from Sept 18 to Oct 16 to give away thousands of unloaded EASY Cards and provide hands-on instruction on using the EASY card vending machines. During this time, free unloaded EASY Cards also were given away at major bus transfer points and select retail outlets. Before the system's official Oct. 1, 2009 launch, MDT already recorded more than 1 million boardings from the 150,000 specially coded EASY Cards that were distributed to specialty discount riders. This, along with the low level of passenger complaints about the new card after its implementation, prove that MDT's campaign to build awareness, acceptance and support for the new system was effective. Target Audience: Tallahassee residents, StarMetro customers Project Cost: $6,177.50 Description: StarMetro first introduced its route decentralization project, known as Nova 2010, in September 2009. 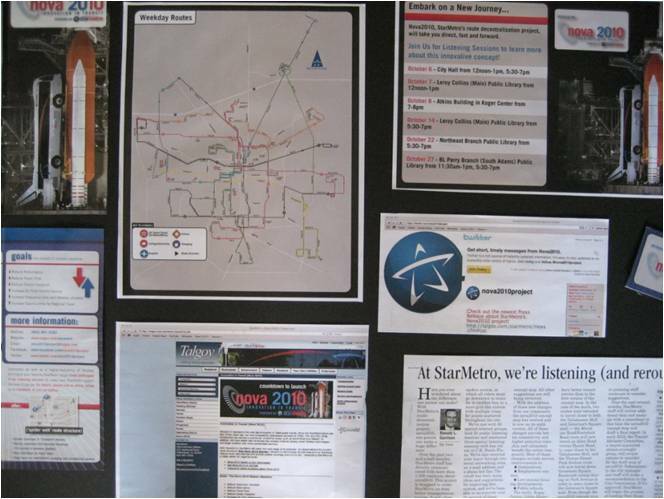 Throughout September, October and November, StarMetro staff executed a public awareness campaign to solicit feedback from citizens and StarMetro customers on the new route design. Throughout the campaign, staff directly corresponded with over 1,500 unique individuals. This direct correspondence stemmed from listening sessions, public meetings, emails and inquiries via social networking sites. Other forms of communication and exposure for the new decentralization project included brochures, direct mail pieces, pocket-guides, car cards, talk shows, radio interviews and a series of articles in the newspaper. After the public awareness campaign, StarMetro presented the final plan and map to the City Commission for approval. The commission UNANIMOUSLY approved Nova 2010. *BEST of the BEST* Target Audience: Environmentally conscious commuters Project Cost: $7700 Description: Transit is a natural ally for the Green Movement and this campaign demonstrated how. The basic color in each design – all by itself – identifies this as an environment-friendly message. Add the icons and pictures and you don’t even need words to see how transit ties into the environment. Target Audience: City of Gainesville residents and tourists Project Cost: $6,323.80 Description: The Arts and Entertainment campaign was designed to fuse tourism and alternative transportation in the City of Gainesville while helping residents and visitors save money as they enjoy Gainesville’s local entertainment. For the campaign, six postcards featuring primary local destinations were created and distributed to each location as well as local hotels, convention centers and bed & breakfasts. 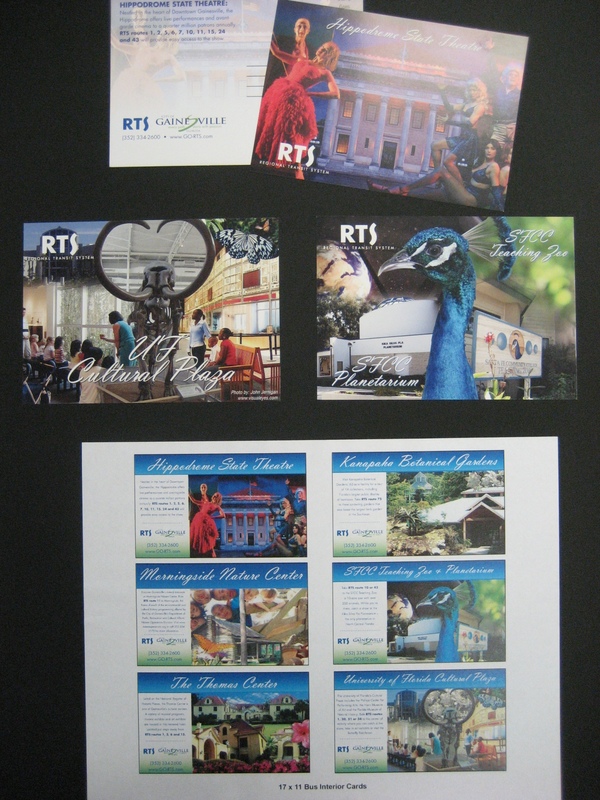 Interior bus cards of each location were also designed as well as a brochure showcasing the six primary destinations along with other popular locations in Gainesville. 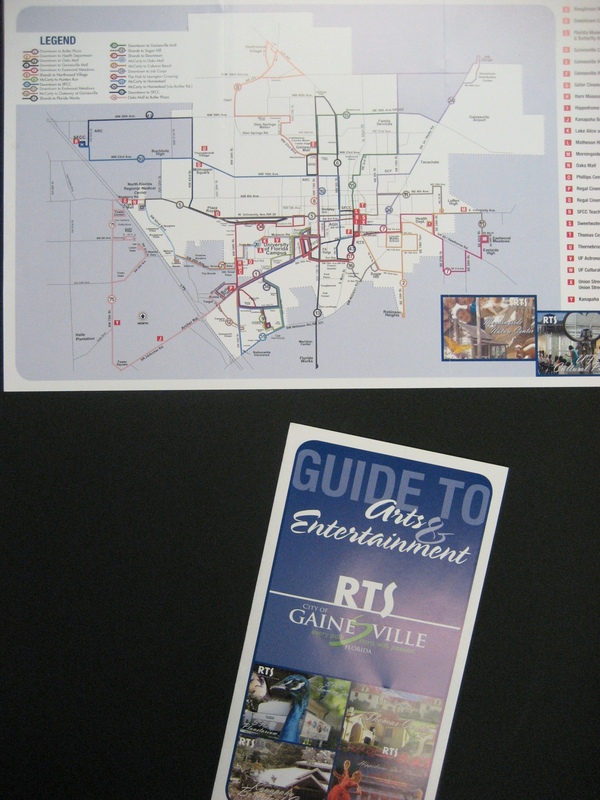 The Arts and Entertainment campaign allowed RTS to promote its service while encouraging local residents and tourists to take advantage of the local cultural and entertainment venues Gainesville has to offer. The success of the campaign benefited public transit as well as local tourism and business in Gainesville. 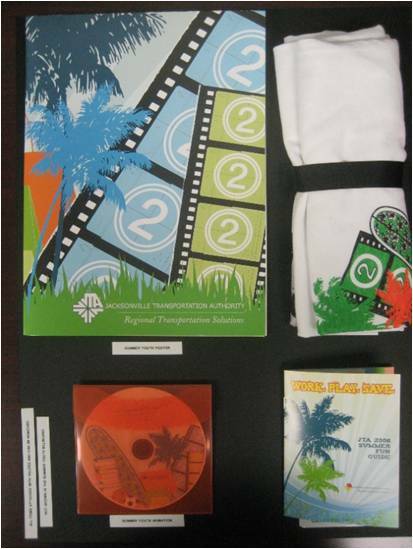 Target Audience: Preteens, teens and parents Project Cost: Collateral Design & Printing – $15,140, Advertising – $17,708 Description: This is the 3rd year that the Authority has provided a summer youth campaign. Our approach was a little different. This year we started by building a partnership with the school board who helped get our message to staff, faculty, students and parents via newsletters and posters that were part of our campaign collateral. We conducted outreach to youth in local movie theater lobbies by setting up tables with T-shirts and information on the program. An animated ad also played before every movie in town. Thirty large format poster billboards reached out to parents stuck in traffic and who know all too well the price of gas. 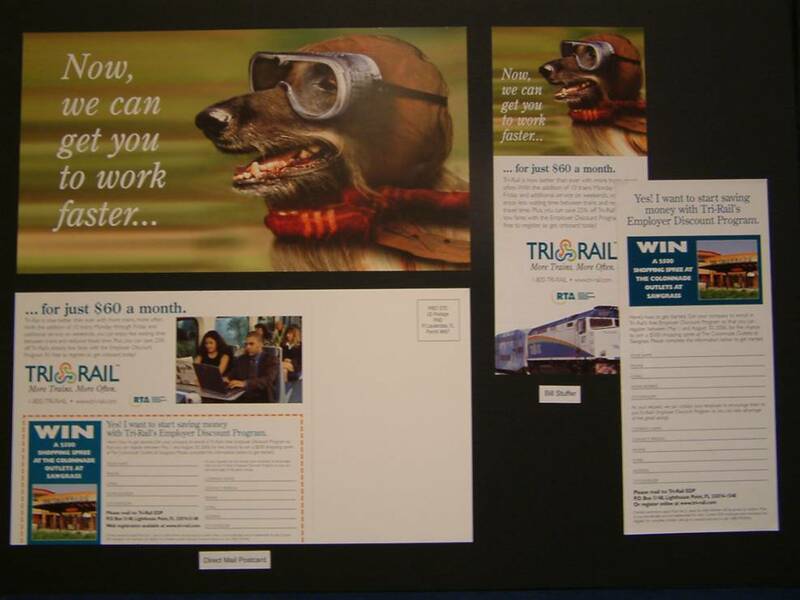 The marketing push for the campaign began in May 2008 and went through August 2008. Summer Youth passes went on sale June 1, 2008. 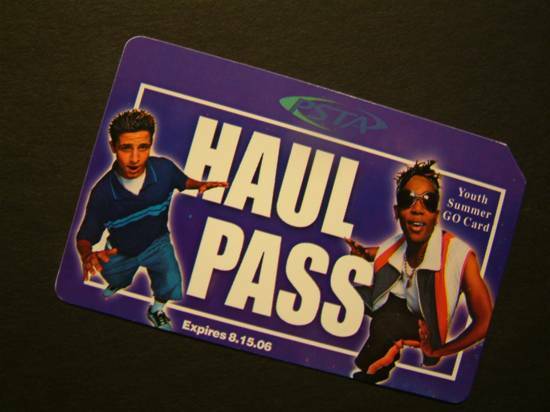 The promotion stated “Purchase a June pass for $30 and get July free, and for a limited time add August for 1/2 price or $15.” The parent or student needed to purchase the pass by June 30, 2008. It offered youth unlimited riders on our transit system at a significant cost savings. Essentially we promoted the cost savings as a comparison to the price of one tank of gas for a mid sized car could get them three months of unlimited rides on our transit system to great summer destinations. We also developed a summer fun guide that was pocket or backpack sized including all popular summer destinations that our target market could go to for work or play. A post campaign summary put together by our Accounting Department showed an astounding increase in sales from last year up 39% each month the campaign was offered. 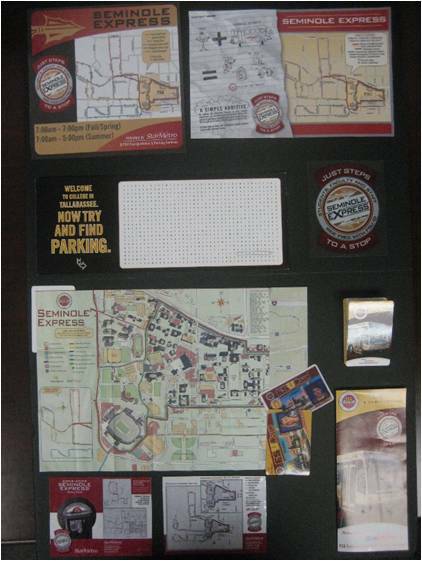 *BEST of the BEST* *Judge’s Favorite * Target Audience: FSU Students – Age 18-25 Project Cost: $0 – production in house and $6,675 printing Description: When StarMetro reinvented Florida State University’s Seminole Express in August 2007, ridership dramatically increased 30%. A year later, StarMetro added an additional route titled “Osceola”, to the existing fixed routes of the Seminole Express. Now with the additional route, which pushes up StarMetro’s reach from 53% to 60% of FSU’s Student population, planners expected an increase of 8,000 to 12,000 additional students riding the Seminole Express. In the first month of operation (August 15- Sept 15), StarMetro has already seen nearly 2,000 new students use the service. Target Audience: ALL Commuters Project Cost: $160,378 Description: Promoted several aspects: renaming of an existing bus route, new fleet design, introduction of new 60-ft long articulated buses and new Breeze service. The Breeze concept was developed based on the “Limited Stop” service along Hwy. 441 with bus stops only at major intersections and is the highest ridership route in the system. The new look included white buses with blue and yellow “swishes” along the sides, making the service easier to brand and for the passengers to identify. In addition, a new Breeze service was introduced along Hwy. US 1. This campaign increased ridership, reduced travel time and enhanced public awareness, especially among the businesses along the route. Commuting on these routes is now a Breeze! *Judge’s Favorite* Target Audience: Any prospective new rider, specifically choice riders Project Cost: $12,660 Description: Elements of the campaign included posters, four-color magazine ads, black and white newspaper ads and T-Shirt give-aways at seminars/trade shows/recreational events. (Fluorescent orange t-shirts were selected for maximum visual impact.) Positioning the bus as a time management tool was the message to time-poor choice riders, highlighting tasks they may not consider could be accomplished while commuting to school/work on the bus. EFFECTIVENESS: The campaign netted an increase of 133% in monthly inquiries for custom transit information from specific points of origin to specific destinations, the majority of the points of origin being in the targeted neighborhoods, where demographically, the choice riders live. Target Audience: Employees starting new jobs/moving to a new location Project Cost: $200,000 Description: This campaign was created with the goal of distributing 100 free bus passes. At the conclusion of the campaign we distributed over 1400 free passes and 7% of those were to first time transit riders. *BEST of the BEST* Target Audience: General Public/Beach Goers Project Cost: $7,600 Description: MCAT created this free service as a traffic congestion mitigation tool at the beach on Sundays and major holidays. In April 2005, ridership hovered around 45 boardings per service day. The route was expanded to originate from the east side of Bradenton. 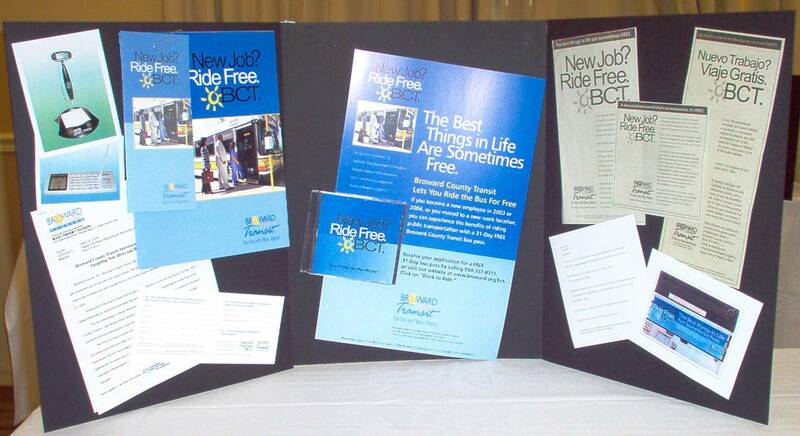 Marketing efforts included direct mail to 6,000 households in a two mile radius around the route’s point of origin (WalMart), direct mail at WalMart, Interior cards in fixed route buses, color ads on MCAT’s website, and black & white newspaper ads that rain in four week flights in a variety of local publications. Ridership on 9/11/05 was 139 boardings, more than tripling ridership in 5 months.